Chris Nadeau is studying a species of water flea whose tiny, easily replicated and manipulated rock pool habitats make them ideal test subjects for predicting how climate change affects the planet’s most vulnerable species. But Nadeau, a Ph.D. student at the University of Connecticut, with a passion for science education, has run into trouble over how to make his research on Daphnia magna water fleas relevant to educators in the classroom. “I haven’t been in high school or grammar school for 20 years, so I don’t have any idea of what someone in grade five is learning and how my research might be useful to them,” Nadeau said. Help came when Nadeau attended a communications workshop as part of his participation in the Second Century Stewardship Research Fellowship program, which is administrated by the American Association for the Advancement of Science in collaboration with the Schoodic Institute at Acadia National Park in Maine and the National Park Service. 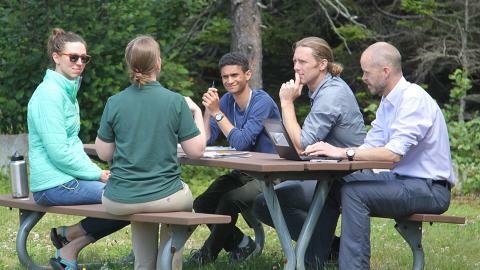 During an intensive, three-day workshop, Nadeau was able to sit down with teachers, as well as National Park representatives, filmmakers, writers and other science communicators to discuss how such communications platforms could be used to spread understanding of his research findings. Read more HERE.